Port Moresby (Agenzia Fides) - Esther Mwayemwana comes from the Trobriand Islands (MBP), and has taught at Caritas over the past 10 years. "My career as a teacher took me to the Caritas Technical Secondary School in 2008. 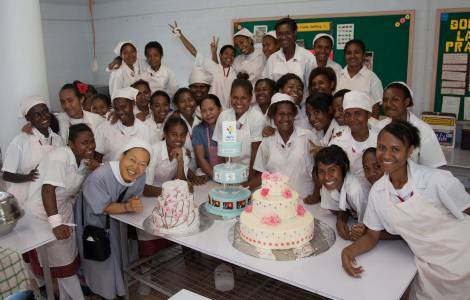 After 23 years of commitment in public schools, I took 10 months' leave and applied at the Caritas Technical School in Port Moresby", she told Fides. "I did not realize that my life would change radically. God had a plan and a purpose for me here at Caritas", Esther admits. "While I was at school, I learned about the Salesian Preventive System and Don Bosco. This meeting motivated me to support the Caritas Sisters of Jesus in their mission to help girls. I taught 10 years here at Caritas and for four years I was also headmistress of the institute". The Caritas Technical Secondary School is based on a very consolidated system. Students are guided to learn how to become responsible. Every Monday morning, teachers propose a virtue, encouraging students to put it into practice throughout the entire week and make it their own for the rest of their lives. "Embracing these values helps them become better people in the world", adds Esther. On Thursday, a Salesian priest from the Don Bosco Technological Institute of Boroko celebrates the Eucharist. The school also gives homework"